If you are looking for the ultimate in high end stoves then you have found the definitive list! 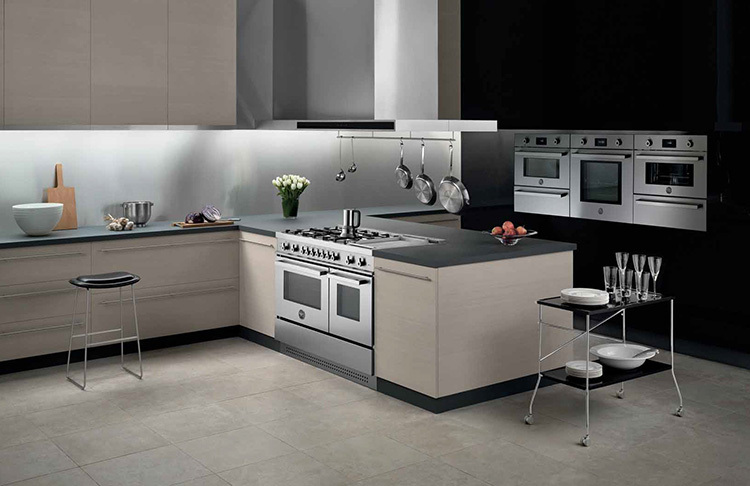 These high end stoves and ranges are made for those who have a taste for the finest in kitchen appliances. These exclusive manufactures definitely do not serve the masses. These are hand crafted and professional quality kitchen ranges that would make any 5 star restaurant jealous. Each of the stoves that have made our list are backed by solid companies that have a reputation of treating their customers with white glove service. La Cornue is an elite brand in high end culinary. In the $50,000 range, the La Cornue is considered the ultimate in luxury appliances. Each stove is made to order, so don’t think that you can go to your local appliance store and pick up one of these gems. La Cornue only makes a few hundred of these high end stoves in a year, so plan to wait 6 months or more after you place your order. Each unit is assembled by hand and by one person who will follow production through to the end and finalize every last detail. Each kitchen range is monitored, controlled and tested at all the stages of production. No, we did not get a chance to test this stove in person, but we will keep trying! If and when we get the opportunity we will let you know! There is not much that has been unsaid about the Viking line of high end ranges. The Viking brand is established in refrigeration and later (with the help of an acquisition) began manufacturing ranges that are the best of the best in professional quality. The Professional 7 Series of ranges it the Viking brand’s top of the line model. 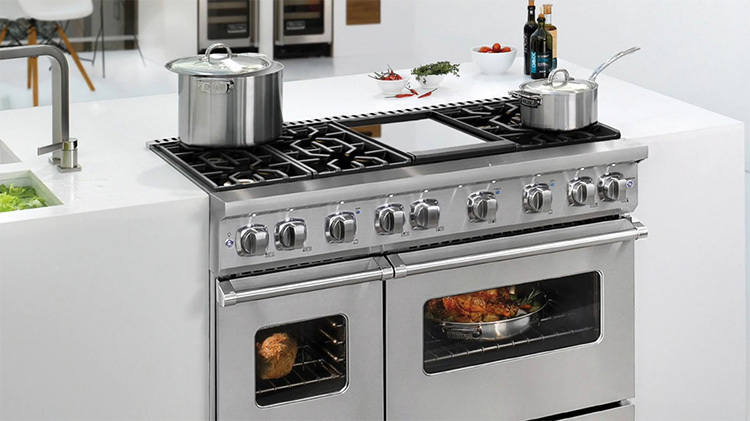 This gas range has 6 burners and plenty of oven room with dual separately controlled ovens. The range is heavy and solid just as you would expect for a range in the $10K plus range. Like most of the high end stoves that we reviewed there is a lack of digital controls. The first thing that hits you when you open the oven door is that there is an incredible smoothness to the motion of the doors. You would think that there are some sort of hydraulics, but this is not the case. 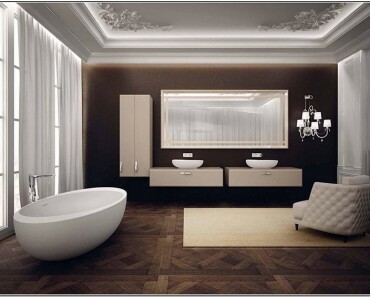 The smoothness and overall fit of each of the parts of this range is simply due to perfection in manufacturing. Gaggenau cook tops have a very distinct, high end and modern look. Gaggenau is a German company but is a subsidiary of the Bosch company who acquired the smaller company. Gaggenau focuses on quality first and offers a 10 year warranty if you buy an entire Gaggenau kitchen. 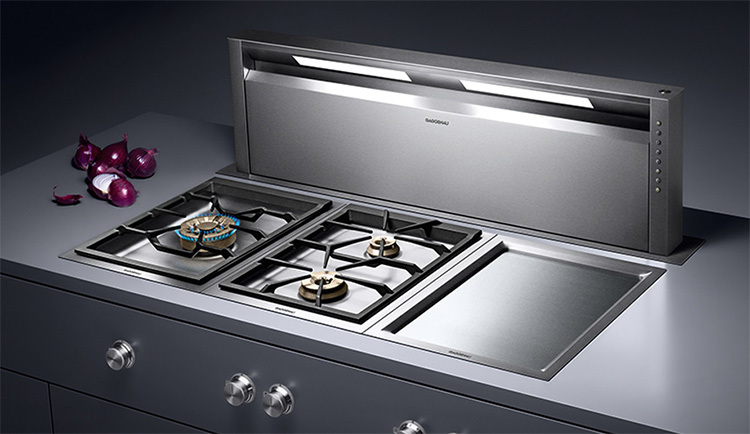 With it’s 36” wide gas cooktop, the Gaggenau uses five brass burners better temperature control. There is a very high 17K BTU output burner in the center as well as two more high output at 13.6K BTU burners making the Gaggenau gas cooktop is one of the most powerful available. The center burner is a three ring burner and all of the other burners are two ring burners, which means all the burners can simmer at 500 BTU with a low of 300 BTU on the middle burner. The inner ring is a very small burner for simmering. The outer ring is the big burner for cooking and boiling water. We like this high end stove for the price.. around the $3,000 range. Also in the $10K range, the Wolf 48 inch range makes the use of “dual fuel” The center of the cooktop use electric with gas burners on both the left and the right side of the stove. We love this brand and we love the combination of both electric and gas stove options. The stainless steel styling looks great in most high end modern kitchens. This high end stove uses digital a digital oven control that is a pivoting panel with simple buttons. 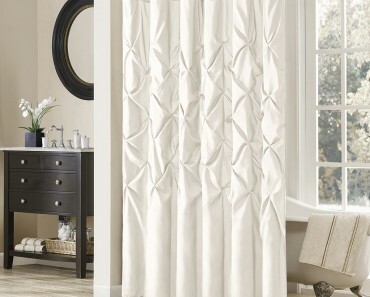 This panel pushes in to hide when it is not in use helping to maintain the minimalist style. The Wolf line of ranges are famous for their big red control knobs, but the option is available for black as pictured above. We like either style, but the red know option can be a bit audacious for high end kitchens that focus on simplicity as part of their beauty. 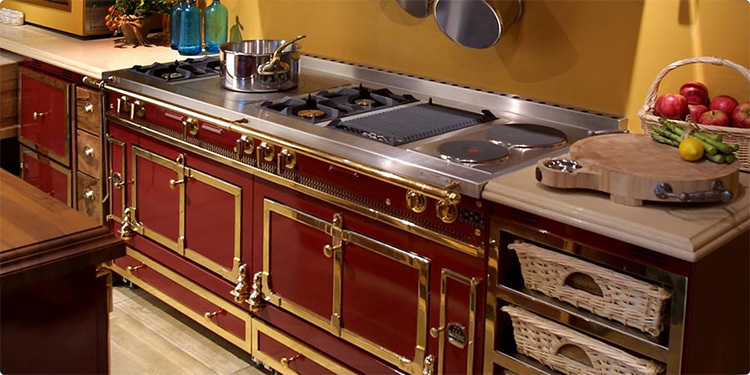 Bertazzoni is an Italian company who has been making high end stoves for quite some time. These ranges are not widely considered to be of the same caliber as a Viking, but we think that it is a close second. The modern styling of this gas range make it very similar to the Viking. The stove top is designed with double burners – a small burner in the center of each burner – so your pots and pans will heat evenly and quickly. The regulation knobs work in reverse… backwards from most stoves. So, when you turn the flame on it is first on high and then you turn the knob further to make the flame lower. This is helpful when you want a very low flame. You can just turn it all the way until it stops and you know that you have the flame at its lowest setting. This is a very heavy stove. 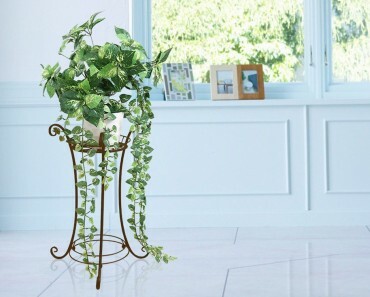 It is sturdy and well built. The quality is top rate and can be felt as you open and close the oven door. Bertazzoni is an Italian company that is known for incredible customer service. There is a toll free number that you can call if you have any trouble inside or outside the 2 year warranty period. Local service technicians will be dispatched to take care of any issues that you may have. 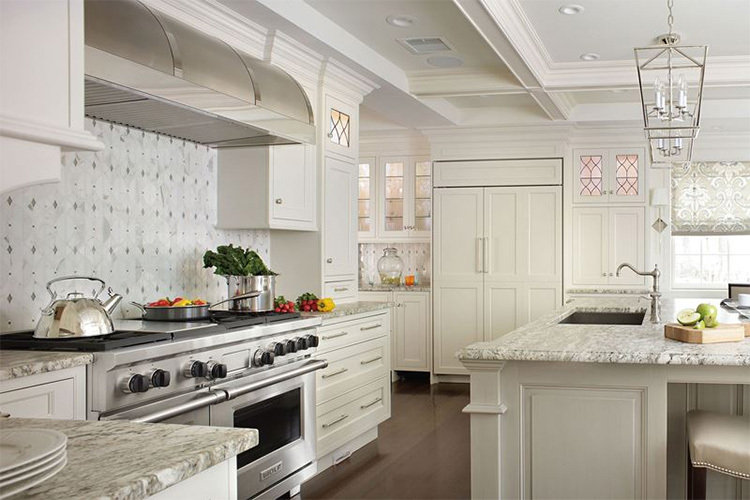 The sleek and clean design looks great in any luxury kitchen.